Some men were holding (guarding) Jesus. They made fun of Jesus and beat him. They covered his eyes so that he could not see them. Then they hit him and said, "Be a prophet and tell us who hit you!" And they said many very bad things to Jesus. The next morning, the older leaders of the people, the leading priests, and the teachers of the law came together. They led Jesus away to their highest court. They said, "If you are the Christ, then tell us that you are!" Jesus said to them, "If I tell you I am the Christ, you will not believe me. And if I ask you, you will not answer. But beginning now, the Son of Man will sit at the right side of God's throne." They all said, "Then are you the Son of God?" 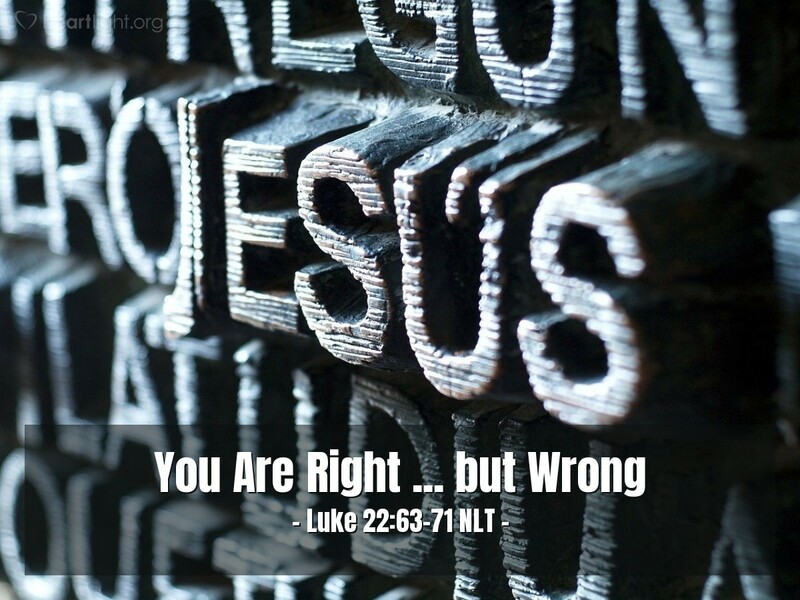 Jesus said to them, "Yes, you are right when you say that I am." They said, "Why do we need witnesses now? We ourselves heard him say this!" The irony of this event is that Jesus' enemies are right in their accusation—he is the Messiah, the Son of God. They are also wrong—they won't believe in Jesus as Messiah and Son of God, but instead are intent on killing him. They are the vivid reminder that we can say the right things and yet refuse to believe them. We can say the right things, but say them in ridicule and be guilty of sin. The battle we face is an issue of our hearts. Are we seeking God's will, or are we protecting our religious interests? Let's continually seek to have our hearts open for God's truth and God's will. Father, as I seek truth, help me seek you and your will first. I know that I cannot authentically live in obedience to your truth without seeking to honor you. Purify my heart and create a right spirit in me. In Jesus' name. Amen.